Fresh Angeles: Trick or Treating Disney Style! Trick or Treating Disney Style! Well it is time again for one of my family's favorite traditions! MICKEY'S TRICK-OR-TREAT PARTY at Disney's CALIFORNIA ADVENTURE. Member all of the Laughs we had LAST YEAR? 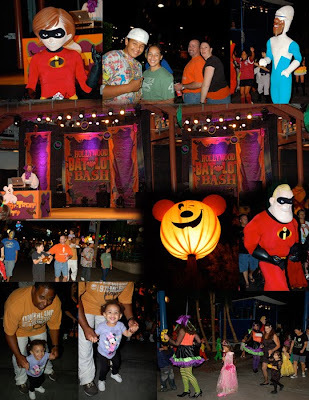 It's the one & only place where you can go as an adult & actually TRICK-OR-TREAT with your children. Also my older kids are just at that point where they feel weird, like they are too old to go trick-or-treating on halloween, so this spot is perfect for teenagers too. Yes, one and all are given goodie bags to go candy collecting throughout the park, where there are stations set up all around. so parents and kids alike are happy with the variety or treats! I will say for the record that my youngest wouldn't put on her costume, so she looks like it's just another day, instead of Halloween. I just know that when she gets older she's gonna look at these photos & wonder why she isn't dressed up! But it was the first time that Kaia actually Trick-Or-Treated! It was sooo cute to see her going up to the people at the stations and instead of saying Trick-Or-Treat, she'd say "PLEEEASE." Awwww! Isn't that ADORABLE??? We were invited by Mickey Mouse himself, with the help of his friend Michele Himmelberg. Thanks Michele!!! Disney’s California Adventure for 12 nights in October. Have you heard about the deal Disney is offering this fall? From Aug. 12 through Dec. 19, 2009, guests will save $400 when they book a 4-Day/4-Night Disneyland Resort vacation package, featuring Disneyland Resort hotel accommodations – Disney’s Grand Californian Hotel & Spa, Disneyland Hotel and Disney’s Paradise Pier – and park hopper tickets. The offer is valid for arrivals Aug. 23 through Dec. 20, 2009. WOW! And get ready for the Christmas Holiday at Disneyland & California Adventure coming November 13 through January 2, 2010. It was very interesting for me to read this post. Thanx for it. I like such topics and anything that is connected to this matter. I definitely want to read more on that blog soon.